Today I received the first ever Fashionbox. 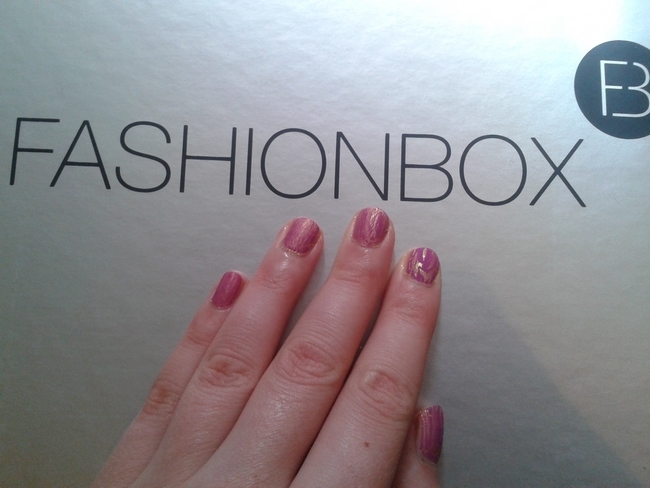 Fashionbox is like the Glossybox, but besides beauty products it’s also filled with some fashion items. 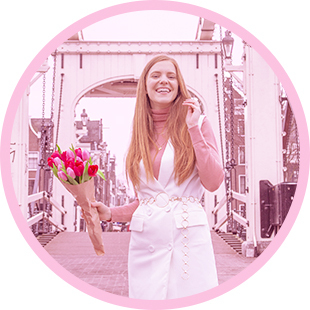 This box is specifically meant for Dutch fashion lovers, but there may be something like this in your country as well. 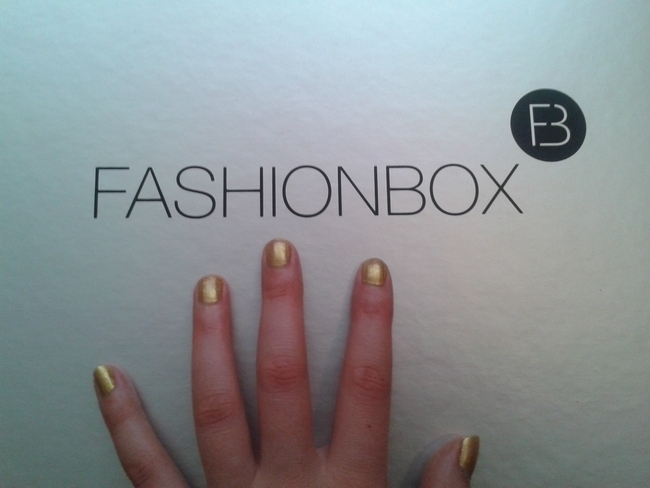 I signed up for the Fashionbox, because I liked the idea and wanted to know what kind of stuff I could expect. So, let’s start with the unboxing! Please keep in mind that all statements in this post are my opinion and therefore not necessarily the truth. Your opinion could of course differ from mine and I respect that. So please, respect mine as well. Thank you! This is what the box looks like. “Looks pretty promising!” is what I thought! And here’s what it looks like while opening the box. Still pretty promising. 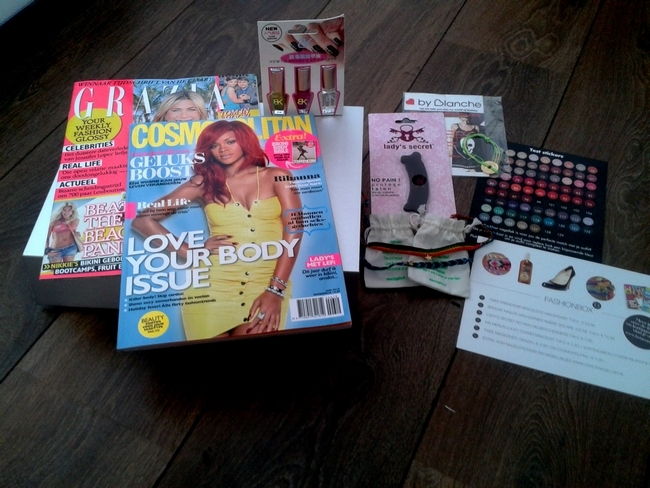 On top of all other items there was a list of items in the box: two friendship bracelets, Bronze Minute by Garnier, Lady’s Secret Heel Protectors, lucky charm bracelet, a 20% discount coupon of lovedbyblance.com (the flyer says .nl, but this doesn’t work), two fashion magazines and a crackling nail polish set. “Hmm, could be ok.” is what I thought now. And then… the unpacked box. First thing to notice: there’s one item missing! They forgot to put a Bronze Minute by Garnier in my box! Not the worst item to be missing because I would never use it. Though this must be said: as soon as I mentioned this to them on Twitter they sent me one and it should be delivered tomorrow. The magazines are from june and july and not september (or maybe even august) as one would expect. But ok, I didn’t buy these magazines in june or july so it should still be fun reading them! The bracelets look very cheap, although they should be worth 31,40 euro’s together according to the flyer. So these things aren’t really my cup of tea. I do like the Lady’s Secret No Pain Heel Protectors! I’m definitely going to try these. I’ve heard they’re really good! 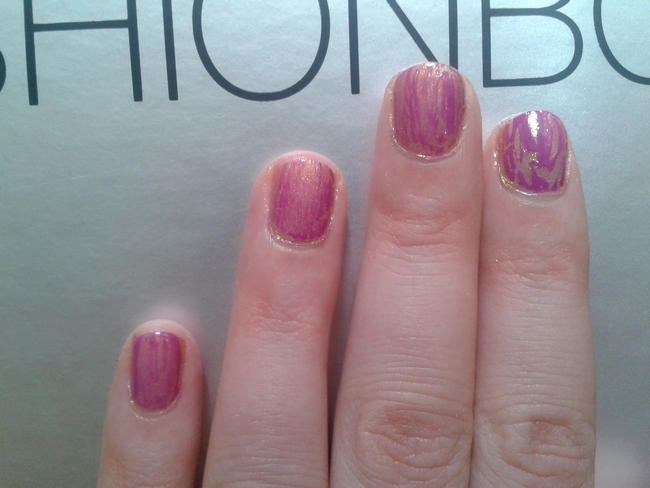 For the crackling nailpolish set I made a special review/swatch for you. It’s a three step set: first you put on the gold nailpolish and let it dry, then the pink crackling nailpolish and finally the top coat. Here’s what the gold looks like with just one layer. I think it looks good! Then I put on the crackling nailpolish. I experimented a bit on how much polish to add in order to get a good crack. My second finger turned out best and this is also the finger on which I used the most polish. So, use a lot of this one! Finally, the top coat. Again, the most right finger is how it should look. I think the crack looks well if you use a lot of polish and make sure the gold layer is very dry before you put the cracker on. So, the polish set works properly. The only thing is, I don’t really like the gold and pink combination. Looks a bit tacky to me. But I guess I could use it over a black nail polish. Mmm, nee best een tegenvaller. :( Alhoewel de tijdschriften opzich wel leuk zijn. Ik vind hem leuk op de vriendschapsarmbandjes na! Hmm, ik vind hem ook niet geweldig. Leuk! Het doet me een beetje denken aan de Glossybox.